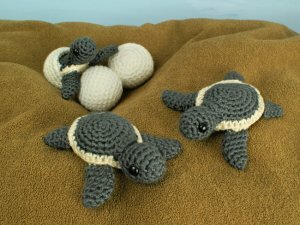 Baby Sea Turtle Collection includes three original crochet amigurumi patterns: Baby Sea Turtle, Hatching Sea Turtle, and Turtle Egg, by June Gilbank. Make a family of life-sized baby sea turtle hatchlings, together with about-to-hatch turtle eggs and an adorable baby turtle who is just emerging from his egg. Make your turtles realistic in greys, browns, or greens, or use any colour combination you want to make a sweet toy in any pair of colours! Size: Sea Turtle: approx 4.5-5" (11.5-13cm) long, depending on how you position the flippers. Egg: approx 2.5" (6.5cm) diameter. Use my Turtle Beach pattern with your baby turtles and make your own turtle blanket! Date Added: 08/11/2018 by Rachelle Y. These little turtles are adorable. The pattern was very easy to follow. Date Added: 05/23/2017 by Katherine M.
Date Added: 05/14/2017 by Tonya C.
Date Added: 03/15/2017 by Rose M.
Date Added: 02/17/2017 by Bridget V.
Date Added: 02/08/2017 by Laurel M.
Date Added: 10/01/2016 by Peggy G.
Date Added: 09/19/2016 by Linda S.